Humor: Sugar Sammy on tour in Chicago! After more than 1600 shows in 31 countries, the Québécois comedian, Sugar Sammy, is back to Chicago during the last week of January with a hilarious show full of sharp humor. Born and raised in an Indian immigrant family in Montréal, he became famous thanks to his show on the stage of the "Just for Laughs" festival in 2004, the largest international comedy festival in the world. He has not stopped since and is internationally famous! 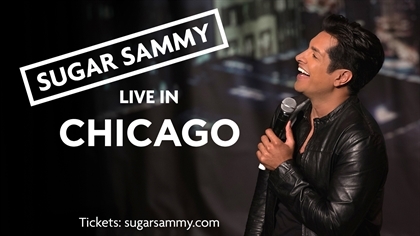 After spending 2 years in France making fun of the Parisian lifestyle and after numerous appearances on French TV, Sugar Sammy is back in North America and is especially ready to make Chicago laugh on these cold winter days. Go and enjoy the show with the code SUGARFAN for a buy one get one free ticket discount. Purchase your tickets HERE for the shows in Chicago and HERE for the shows in Rosemont. *Sugar Sammy is not appropriate for sensitive audiences. Must be 21 or older to attend.